On 30th November 2018, 101 Theatre Support Battalion REME congregated at South Cerney celebrating its first St Eligius weekend as a new battalion amalgamated under Army 2020 Reserve. Formerly 105 Battalion REME and 101 Battalion REME, the new 101 Theatre Support Battalion REME has personnel located in Bovington, Bridgend, Cwmbran, Gloucester, Liverpool, Manchester, Plymouth, Swindon, Telford, Walsall, Yeovil, with Battalion HQ at Keynsham, Bristol. St Eligius is the patron saint of goldsmiths, metal workers, veterinarians, people who work with horses and, of course, the patron saint of the REME. Eligius, a goldsmith at Paris, was commissioned by King Clotaire II of the Franks to make a throne. With the gold and precious stones given to him he made two. Struck by his rare honesty, the King gave appointed master of the mint, at court. Later in life fulfilling his desire to serve God he was ordained and then made Bishop of Noyon and Tournai. St Eligius day commemorates his death on the 1st December circa 660 AD. 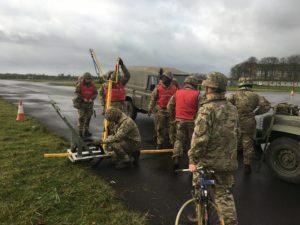 The main event for the weekend was the Commanding Officer’s Engineering Challenge which tested the Company’s teams’ abilities to design and procure, manufacture and deploy a projectile weapon that would fire golf balls at various targets and varying ranges. Additionally, the teams needed to design and procure materials for a mobile platform to transport the projectile weapon around, over and through a series of obstacles to the weapon firing point. Each team was allocated £200 to obtain suitable materials. As one knows, one cannot work on adrenaline alone and, with the festive season being upon us, the officers and Senior non-commissioned Officers showed their appreciation by serving the Battalion’s junior ranks a sumptuous Christmas dinner complete with the obligatory sprouts, saturated in a delicious turkey jus, traditional Christmas pudding and a light, fluffy mince pie. The officers and senior ranks took the opportunity to say a fond farewell to the Commanding Officer, Lieutenant Colonel Anders-Brown on his dining out at the Battalion Officers’ Mess in Keynsham, Bristol. A delicious spread of Indian cuisine, with a fine selection of desserts and cheese board, expertly prepared by Corporal Badman and his team of chefs, was enjoyed by all. A long bow projectile launcher on a light weight carriage. The Death Trap uses a front spring from a Mk IV VW Golf, to catapult the golf ball. It was designed to exploit the elasticity of the golf ball, by allowing adjustment of the strike point. A hydraulic ram compresses the spring; a bridging plate holds the spring under tension and the bridging plate is knocked with the handle and striker. Various options had been considered: one was using a spring chamber from an HGV Vehicle, which had considerable power however the throw was too short; another option envisaged the use of a conventional golf club (but Tiger Woods was unavailable). A sling shot design preassembled but subsequently modified to improve manoeuvrability over and through obstacles. This produced a light platform with a consistent straight line and easy to adjust trajectory. Although it’s quite large, the modularity improves mobility of the Peril. The device took approximately two hours to build and six hours to fettle. 127 Company claimed to have developed a revolutionary piece of equipment, expected to transform the modern battlefield and promote this as a simple but highly effective device, a lightweight multipurpose tool combining offensive, defensive and logistical capabilities, and making it invaluable to commanders at a variety of levels. All the materials were recycled. It’s a crossbow design using a tensioned steel spring on a pivotal mount, using steel stranded wire across the bow. It has an advanced trigger mechanism with a safety catch. A crumpled ball of blue tissue was used to stabilise the golf ball projectile. 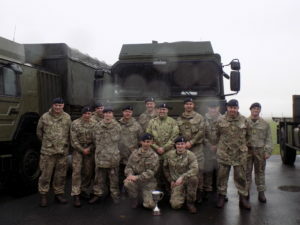 The weekend concluded with the presentation for the Commanding Officer’s Engineering challenge to 159 Theatre Support Company from Walsall and the award of prizes. The weekend was a huge success, despite the inclement weather, and cemented relationships, both newly forged and long established.